Aixtron Metal Organic Chemical Vapour Deposistion (MOCVD) Closed Coupled Showerhead system - ACT Node. For a full,searchable listing of ANFF capabilities/tools (all 8 nodes) click here. Electron beam (e-beam) lithography is most suited for prototyping due to the combination of flexibility and patterning accuracy. Our RAITH 150 electron-beam lithography is a versatile 30kV system that allows the control of the e-beam to expose dedicated resists to create lithographic patterns well into the sub-µm range. Feature sizes smaller than 20 nm are frequently exposed and we are able to handle sample sizes from a few mm to 8-inch wafers. Hardware and software automation allow easy and repeatable multilayer exposures. The system is equipped with FBMS exposure technology with ‘zero-stitching-error’ approach for patterns that can be from several millimeters up to centimeters long, while maintaining lateral dimensions below 100nm up to micrometers. Electron Beam is services on Dec. 10, 2015 and the latest beam calibration is available here. As part of our e-beam facility we support both positive and negative tone resist processes. Positive resist PMMA formulated with 495K & 950K molecular weight resins in 2% and 4% anisole respectively is available for high resolution patterning. High sensitivity ZEP520 is most often employed for more dry etch resistant masking. Negative tone e-beam resist maN 2405 is suitable for precision masking at the exposed areas. Further dilutions in anisole for all three available e-beam resists can be requested. Our Temescal BJD-2000 E-beam/Thermal Evaporator system features a six pocket E-gun and one-position thermal evaporation. 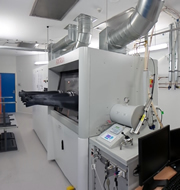 The system also has an extended chamber for a larger distance between source and sample to avoid excessive heating during thick metallisation making the system very suitable for lift-off processes. The system is dedicated for ohmic and Schottky contacts in III-V compound semiconductors. The vacuum consists of a scroll pump and a cryo-pump allowing for a vacuum range in the mid 10-7 mBar. Available metals are: Al, Au, Cr, Ge, Hf, Nb, Ni, Pd, Pt, Ta, and Ti. Dielectric materials are not authorised. The 30kV e-beam of our FEI Helios 600 NanoLab allows for very high resolution SEM imaging (0.9nm) alongside other ion-beam features like simple milling, 3D reconstruction (slicing & SEM) and TEM lamellae preparation (also available in automatic mode). The system is also available for ion beam deposition of Au, Pt and SiO2 as well as reactive ion beam etching with the addition of XeF2 (SiO2) or I2 (III-V). Additionally EDX, EBIC, EBSD and STEM analysis techniques are available. Our Versaline LL ICP Etching system features a load-lock, a heated electrode (180°C max) and He-backside cooling. Also, end point detection and optical emission spectrometer are available to enhance in-situ monitoring. 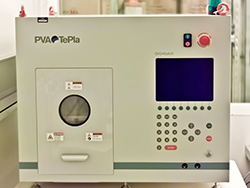 This high density plasma source system allows controlled etching while maintaining low ion bombardment, resulting in lower plasma-induced damage. The available gases (Cl2, BCl3, CH4, H2, CHF3, SF6, Ar, N2, O2, and He) allow etching of dielectric films (SiNx & SiOx), common III-V semiconductors (Si, GaAs & InP, GaN and ZnO) and metals (Al, Ti, Nb). This system is a Closed Coupled Showerhead (CCS) model from Aixtron. In that configuration, precursors and gases are introduced vertically into the process chamber through an array of very small holes in the reactor ceiling, just like a showerhead. The design of the showerhead and its close proximity to the heated wafers ensure the gases are distributed very uniformly throughout the whole wafer carrier surface. 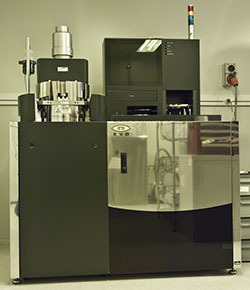 The system is capable of growing 3 x 2-inch wafers in each run and equipped with the LayTech Epi-TT, an optical in-situ metrology tool that allows the user to monitor all essential properties of the growing layers, such as growth rate, film thickness, stoichiometry changes and morphology, and also the precise surface temperature. The benefits of the in-situ process monitoring tool include quick identification of process deviations, optimisation of the film quality, improvement of yield and the fast tracking of new processes. This system is dedicated to As- and P-based materials. This system is identical to MOCVD1 and is CCS model from Aixtron where design allows an excellent growth uniformity throughout the whole wafer carrier surface. Similarly the system is capable of growing 3 x 2-inch wafers and it uses NH3 as a gas source to produce N.
This system is dedicated to grow N-based materials. 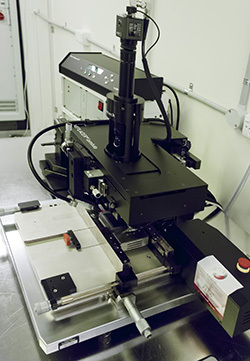 The mask aligner (EVG 620) operates in the i-line range and is suitable for optical lithography down to 1µm. It is suitable for 2", 4" and 6" wafer sizes. It also offers the possibility of creating sub-µm patterns in nano-imprint mode (UV curing mode) through a transparent 3D mould. The hot embossing tool (EVG 520HE) allows sub-µm patterning using a non-transparent mould and also allows for adhesive wafer bonding. A special mask holder will soon become available to allow the lithography on small (typically 1x1cm2) samples. 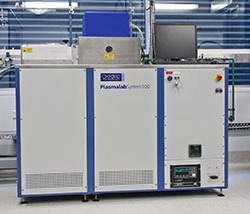 The PicoSun-Sunale thermal/plasma assisted atomic layer deposition tool (PA-ALD) has gained enormous popularity among our users and it usage has surpassed that of the ICP or PECVD tools. Available materials to be deposited are: Al2O3, TiO2 and TiN, ZnO, HfO2, Ta2O5 and TaN, and SiO2. We are looking to fit a silver (Ag) source in the PicoSolid source making it possible to deposit multiple layers of pure metallic silver films. 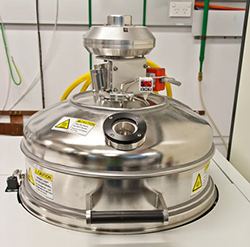 This chemical vapour deposition system features a load-lock, a very high electrode temperature (700°C) and the use of dual frequency plasma generators. The high T-range allows for obtaining good quality dielectric films like SiNx and SiOx with reduced hydrogen incorporation while the available He gas can be used to deposit amorphous and poly-crystalline Si. The dual frequency generator allow tuning of the mechanical/residual stress of the deposited SiNx layers between tensile and compressive strain and, alternatively, to choose stress-free layers. 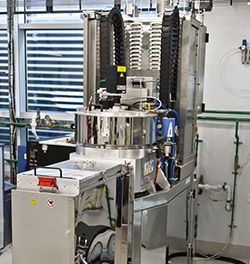 The system is fitted with a TEOS capability (terta-ethyl-ortho-silicate) enabling high quality SiO2 deposition at even lower temperatures (150°C) - this capability is unique in Australia! The available gases are: SiH4, NH3, N2, N2O and He. The system is meant for depositing SiOx @ ~55nm/min, SiNx @ 15nm/min, α-Si at 300°C and poly-Si at 500-600°C @ 4-6nm/min. The FEI Verios has a field emission gun and a mono-chromator suitable for ultra-high resolution imaging. In addition to the Everhart-Thornley and in-lens detector, the new SEM-CL boasts several new electron detectors, such as retractable directional backscattering detector(R-DBS), a mirror detector and an in-column detector suitable for imaging at low energy. 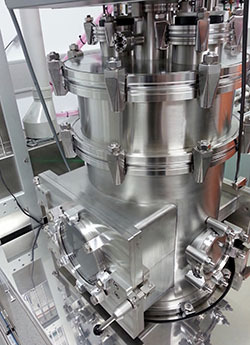 This instrument is equipped with an Oxford electron dispersive X-ray (EDX) spectrometer with an 80mm2 silicon drift detector currently installed. 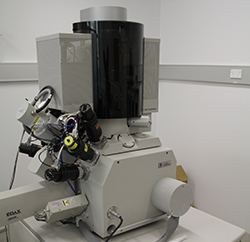 In early 2015, a Gatan MonoCL4 Elite cathodoluminescence (CL) system was installed on this instrument enabling CL mapping and spectroscopic studies at room temperature and low temperatures. The sputter system features microwave and DC sputtering with six guns available and a load-lock allowing a maximum wafer size of 100mm. The system features co-sputtering from two targets and oxygen monitoring during oxide sputtering. Recently a lift-off process based on a negative resist (Ma-N 1420) has been developed to be used with the sputter system. A high pressure plasma system to descum and strip resists in O2-plasma and other organic materials. The low power feature allows footage removal after resist development to obtain clean patterns. With the addition of CF4 combined stripping of resists and SiNx/SiOx is possible. 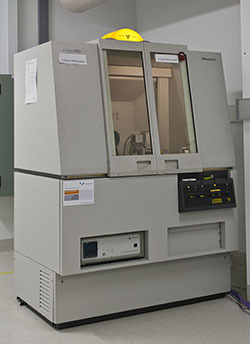 This machine is capable of handling up to two 4" wafers or one 6" wafer. • Focused beam size to ~300µm. The system is supported by powerful software to analyse data with possibility of various models such as Cauchy or Tauc-Lorentz models. The system resolution is as small as 1nm (semiconductor native oxide can be measured). 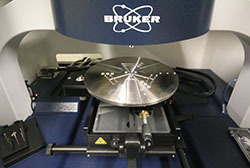 This ellipsometer compliments the existing instrument at the WA Node that has a spectral range of 2-20µm. Flip Chip bonding is a technology that allows for bonding various type of devices/chips onto different substrates, like bonding a laser/LED onto a Si-chip, to add optoelectronic functions to the well-established microelectronic and Si-based photonic circuitry that lack active devices (lasers and detectors) operating at the telecommunication wavelength of 1.55μm. The ANFF ACT Node Fineplacer Lambda tool allows an alignment accuracy of 0.5μm, and a similar tool is available at the WA Node. Thermal annealing processes are commonly used to remove implantation damage, activate species and alloy materials (ohmic contacts of metal on semiconductors). Thanks to the use of halogen lamps this RTA features a very fast heating cycle (typically a few hundreds °C in a few seconds). To aid SEM inspection of non-conductive materials a conductive layer is required to avoid electrons charging in the SEM column. 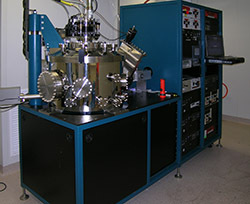 Typically 2nm of Au/Pd or Au is sputtered using this system prior to SEM analysis. 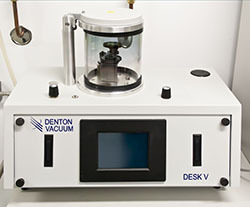 The system allows for sputtering under a tilted angle and rotation and can handle sample sizes up to 30mm in diameter. This mechanical surface profiler allows very accurate 1D step height measurements. The analysis capability also allows for measuring wafer bow (to calculate mechanical stress) and 1D roughness. Available stylus sizes are 12.5µm and 2µm and vertical resolution is as small as 1.1nm. 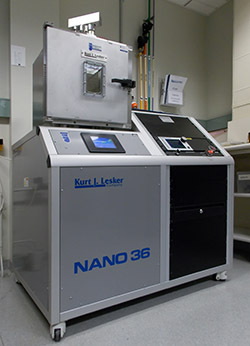 The Kurt Lesker NANO 36 system is configured as a thermal evaporator featuring a user friendly interface and offers the possibility of having up to three different materials in the three boats provided. The NANO 36 is designed to accommodate most evaporation processes and already various metals have been deposited using this system like gold, copper, aluminium and zinc. Also chromium is able to be deposited using a relatively high current. For gold deposition a boat is supplied to users as well as a certain amount of gold (at cost). For training and use contact Fouad Karouta, Mykhaylo Lysevych or Kaushal Vora. 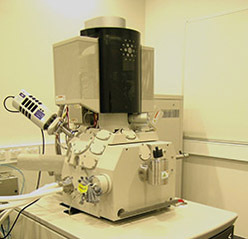 The alpha300 S is a user friendly Scanning Near-field Optical Microscope (SNOM) that combines in a unique way the advantages of SNOM, Confocal Microscopy and Atomic Force Microscopy in a single instrument. Switching between the different modes can easily be done by rotating the objective turret. 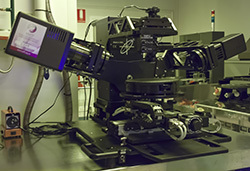 The alpha300 S uses unique micro-fabricated SNOM-cantilever sensors for optical microscopy with spatial resolution below the diffraction limit. 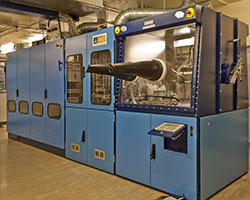 We have a variety of electrical characterisation facilities for electrical and opto-electronic devices, and also the determination of the electrical properties of various materials that includes temperature dependent I-V, C-V, Hall Effect, 4-point probe, DLTS and a semiconductor parameter analyser. The High Energy Implanter features a 1.7MV tandem accelerator incorporating a 100kV injector with a SNICS II negative ion sputter source. Used for implanting ions in the energy range 15-100keV (using the injector only) and 200keV to several MeV (depending on selected ion charge state). Most ions are available but implant fluences may be limited in some cases. 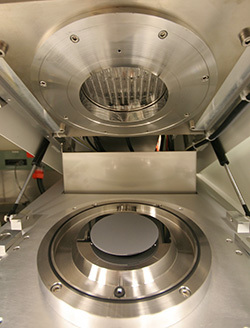 Typical samples sizes are a few cm square but wafers up to 100mm diameter can be accommodated (150mm wafer chamber currently under construction). Smaller samples can be heated to 700°K or cooled to 77°K during implantation. The Low Energy Implanter features a 175kV accelerator with a SNICS II negative ion sputter source. Used for ion-implanting materials with energetic ions in the energy range 10keV to 175keV. Typical samples sizes are a few cm square but wafers up to 100mm diameter can be accommodated. Many ions are available, including most standard dopants. 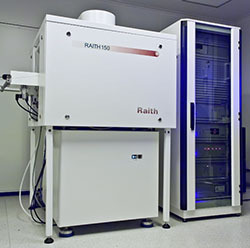 The Rutherford Backscattering Spectrometry (RBS) system features a 1.7MV tandem accelerator incorporating a 60kV injector with an Alphatross ion source. 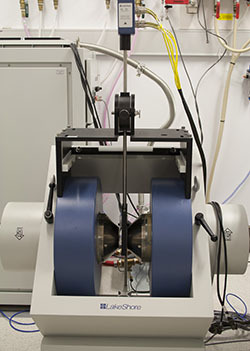 Used for ion-beam analysis of materials with energetic He+ and H+ beams (typically 1-3 MeV). Standard techniques include Rutherford backscattering and channelling analysis (RBS-C) and elastic recoil detection (ERD) for hydrogen profiling. Particle-induce x-ray analysis (PIXE) is currently under development. Typical sample sizes range from 5mm square to several centimetres square. Metal Organic Chemical Vapour Deposition (MOCVD), also known as Metal Organic Vapour Phase Epitaxy (MOVPE), is an epitaxial growth technique of materials, especially compound semiconductors, from the surface reaction of organic compounds or metal-organics and metal hydrides containing the required chemical elements. 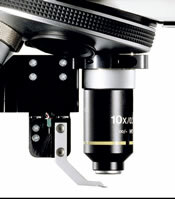 • Free space microscope (Long working distance 20x and regular x20 objective lenses only) for larger, non-flat samples. • High-performance edge filter to allow low wavenumber measurements down to ~30cm-1 for the 532 nm laser (down to 100 cm-1 for the 633 nm and 785 nm lasers). X-ray diffraction is a non-destructive analytical technique which reveals information about the crystalline structure, chemical composition and physical properties of materials and thin films by studying the scattered intensity of an X-ray beam interacting with a sample as a function of incident and scattered angle, polarization, and wavelength or energy. Analytical techniques include rocking curve, reciprocal space mapping, reflectivity, grazing incident XRD, strain/stress, texture, micro-diffraction and powder analyses.